After the hullabaloo about conserving energy and hybrid cars and a lot of bull…, this velomobile seems to be the only better alternative to moving around without burning a hole in the pocket. It has a solar-panelled roof that can power this babe up to 45 miles and runs on a 600W electric motor. So, no gases, no hydrocarbons and no toxic waste..! Additionally, if the rider is young and can pedal, the pedalling power, converted to kinetic energy, can take this babe across the 100 mile marker. 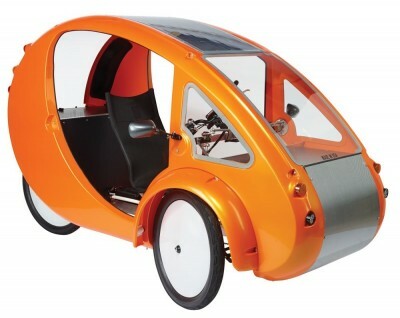 However, the pedalling has to be simultaneous along with the running electric motor. The maximum speed on just the motor is 20mph and with pedalling, it could go up to 30mph. The transmission on this piece of magic is intelligent enough to synchronise your pedalling with the motor. Don’t judge by its size or fragile looks. This environmental friendly vehicle is made with aluminium [grade used to manufacture aircrafts] mounted on stainless steel chassis and highly durable carbon-fibre body. The LED lights and indictors are strong enough to signal afar. The steering is very similar to a bicycle and this one comes with rear disc-brakes. Although small to look at, anyone who is 5’ to 7’ tall can ride this with ease. The recharge is quite quick, either 7 hours in sunlight or 2 ½ hours through direct AC charger provided. 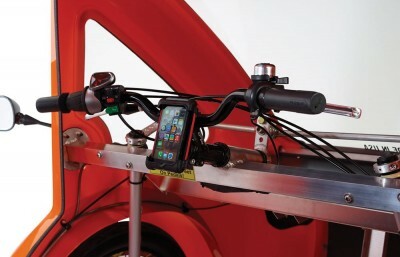 Classified as a bicycle, there are almost no legal paperwork or license requirements. The dimensions are quite small – 105” L X 48” W X 60” H and weighs only 150 pounds. Priced at around USD 10,000, this is a steal for middle aged and the seniors to get around with ease and no maintenance. I like the car. How do I keep out rain or others from taking it? Does it have doors? Do I have to peddle it or is it totally mobile via solar? what safety avenues would I have cuz I want one eventually.